Pontremoli is a well-preserved medieval town in a scenic setting between two rivers. Above the town is a restored castle with a museum of prehistoric stele statues. Pontremoli is the principal town and northern gateway of the Lunigiana region, a less-touristed area of Tuscany, where you'll find remains of many Malaspina castles, picturesque medieval villages, and nature areas with good hiking trails. 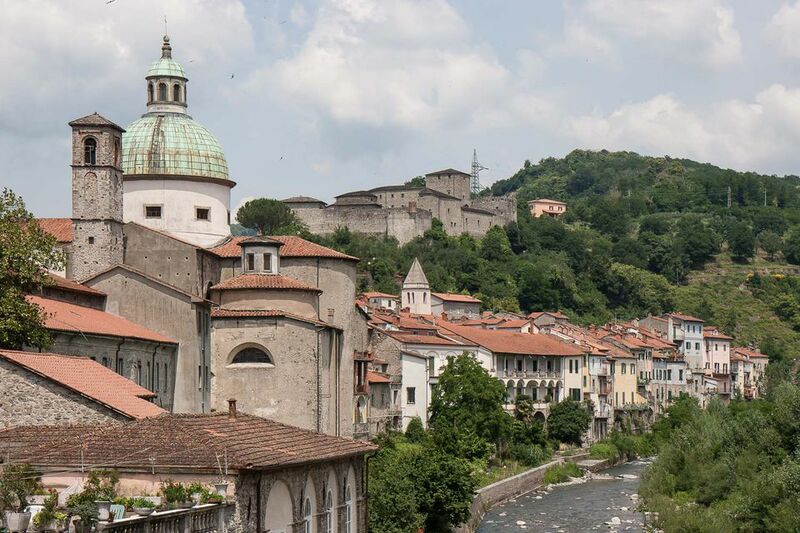 Pontremoli lies between La Spezia on the coast and the city of Parma in the Emilia - Romagna region, at the very north end of Tuscany and the Lunigiana region. It's also the gateway to the Appenine Mountains and is on the Via Francigena, an important pilgrimage route. The town's medieval section lies between the Magra and Verde Rivers that join at the southern end of the town. The Lunigiana is a great area for renting a vacation house in a small village or in the countryside. The Hotel Napoleon is in town and there are a couple of places with bed and breakfast accommodations which you'll see as you explore the town. The historic center has one main street, running from the Parma gate at the north end to the tower at the south end. Beyond the tower is a nice park between the two rivers with a picnic area. Pontremoli has two beautiful stone bridges for pedestrians that connect the historic center with the part of town across the Verde River. The Accademia della Rosa Theater, built in the 18th century, is the oldest theater in the province. The Church of San Francesco, across the Verde River, has Romanesque features. There are several other interesting churches in the town. Castello del Piagnaro is a short walk uphill from the center of town. The restored castle is open to visitors, see their website for hours. Piagnaro Castle gets its name from the slate slabs, piagne, common in the area. From the castle, there's a great view of the town and the surrounding hills. Inside the castle is an interesting museum of stele, sandstone sculptures that are the most important artifacts of prehistoric times, dating from the copper age to Roman times. Below the castle is the pretty oratorio of Sant'Ilario, built in 1893. The Cathedral and Campanile: The Duomo is in the center of the old town. Construction on the Duomo started in 1636. Its Baroque interior is decorated with rich stuccoes. The tower near the Duomo was the central tower of the walls, built in 1332 to divide the huge central square in two to separate the two rival factions. In the 16th century, it was turned into a bell and clock tower. Today Piazza del Duomo is in front of the Duomo and Piazza della Republica is on the other side of the Campanile. In this area are shops and several cafes and restaurants. There's also a small tourist information office near the Duomo. An outdoor market is held on Wednesdays and Saturdays. Food and a few clothing stalls are in the two main squares of the historic center. There are also stalls selling flowers, clothes, and other items around Piazza Italia, in the newer part of town. There's a nice picnic area in the park between the rivers near the tower. If you want to picnic, there are several shops selling cheese, cold meats, and bread. There are several good restaurants serving regional dishes in central Pontremoli, both on the main street through town and just off the street on little alleyways. Regional dishes include testaroli with pesto, pasta with mushroom sauce, and torte d'erbi, an herb pie often served as an appetizer. Pontremoli is on the train line between Parma and La Spezia and the train station is just across the street from the town. Coming by car, there's an exit from the Parma - La Spezia Autostrada. Enter town by crossing the Bridge of Statues that cuts across the old town and connects to the newer part of town and a large parking area off to the right. With a car, you can explore the hills, villages, and castles nearby. There are buses o many villages and towns in the Lunigiana region. The town itself is small and easily explored on foot. Pontremoli and the area around it were inhabited in prehistoric times. Pontremoli became an important market town in the 11th and 12th centuries, a place where the main roads of the mountain passes came together. Its castle was built in the 11th century to control the network of roads. The Duomo, or cathedral, was built in the 17th century and its theater, built in the 18th century, was the first in the region. Churches and buildings are both Romanesque and Baroque style.